This post was updated to reflect that these improvements have been made available in Outlook for Android. Outlook for iOS and Android is on a mission to help you accomplish more with your email and calendar while on the go. With our latest release, we’re addressing one of our most highly requested features with improvements to our People experience. You now have the ability to add and edit contacts right from Outlook on iOS and Android. We’ve also completely redesigned the contact card to show more details—including latest conversations and shared files—and enabled easier calling and messaging with your contacts. 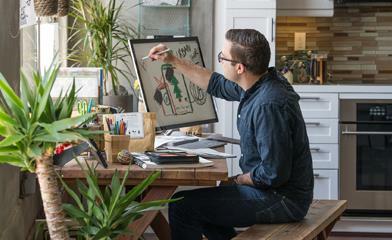 Here’s a deeper look at what’s new. With our latest update, you can now add and edit contacts for Outlook.com and Office 365 accounts (support for Google contacts coming soon). To create a new contact in Outlook, simply go to the People tab and tap the + sign. You can also add a new contact directly from a message or event by tapping the name of a person and then tapping Add Contact. Lastly, you can also use the search bar in the People tab to find and add contacts from your company directory. Once you’ve added a contact, you can edit their information by opening the contact and tapping the Edit button. Any changes made in Outlook for iOS and Android will be synced and available across all versions of Outlook. The contact card has also been redesigned to put your contacts’ key details front and center. Tap on any name in your messages or events to access phone numbers, email addresses and other details, like Skype IDs, along with your contact’s picture. Tapping a phone number will allow you to choose between calling, messaging or FaceTiming your contact. The new contact card now also displays your recent conversations, shared attachments and any upcoming meetings you have with that person. While you can fully manage your contacts in Outlook, you can also save your contacts to the default Contacts app on iOS and Android. This allows you to easily see the name of a contact when you receive a call or text message from them, and view all of their contact information directly in the built-in Contacts app. Due to the underlying capabilities of iOS and Android, how this works differs slightly by platform. 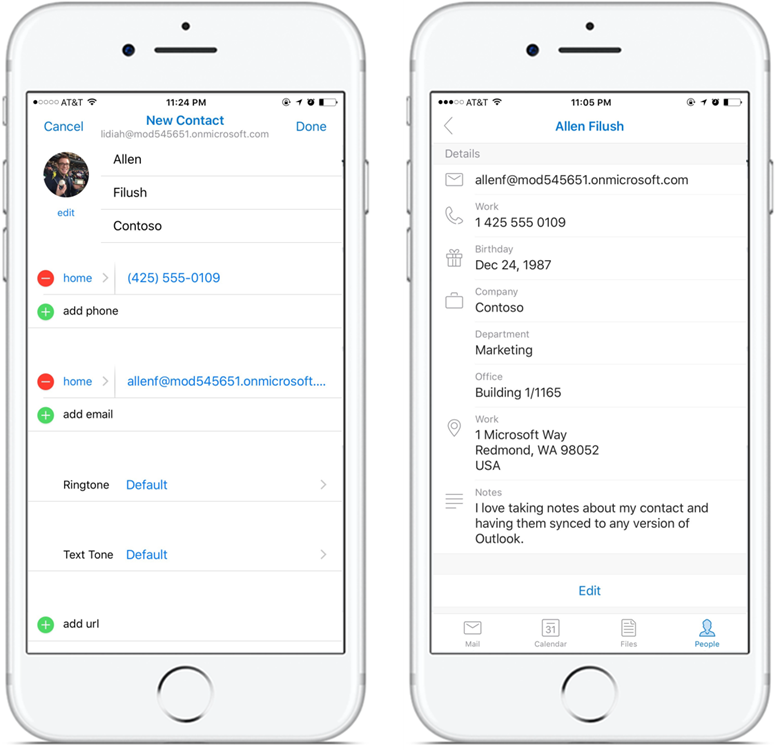 On iOS, Outlook provides a one-way push of contact information from Outlook to your phone. All newly added contacts and changes should be made in the Outlook app, and these changes will sync to your built-in Contacts app and your email service. 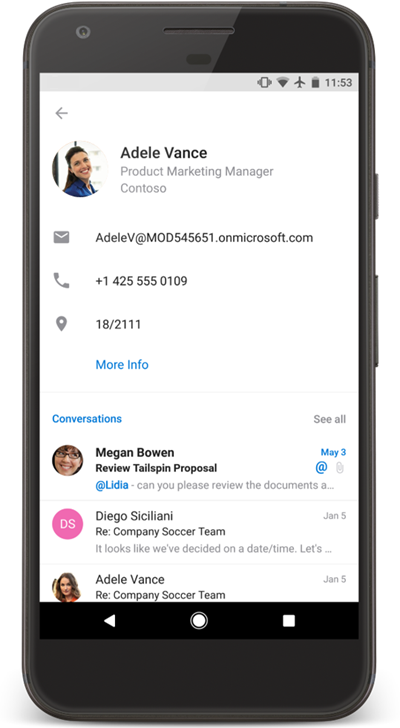 However, edits made in the Contacts app will not sync back to Outlook or your email service, and will be overwritten the next time Outlook syncs to the Contacts app. You should avoid making edits in the Contacts app. To enable Caller ID with your Outlook contacts, navigate to your account within Settings and tap Save Contacts. On Android, Outlook is able to fully synchronize with the Contacts app. Therefore, users can choose to add new contacts or make changes in either the Outlook app or by using the built-in Contacts app on Android. Changes made in either location will sync back to your email service. To enable full contact sync on Android, navigate to your account within Settings and tap Sync Contacts. If you’d like to remove the contacts at a later time, you can toggle the switch in Outlook and they will be removed from your address book. Let us know what you think of our new People experiences! If you have other ideas for what would make Outlook even better for you, let us know right from Outlook by going to Settings > Suggest a Feature.